Peace in Colombia? Just in time! 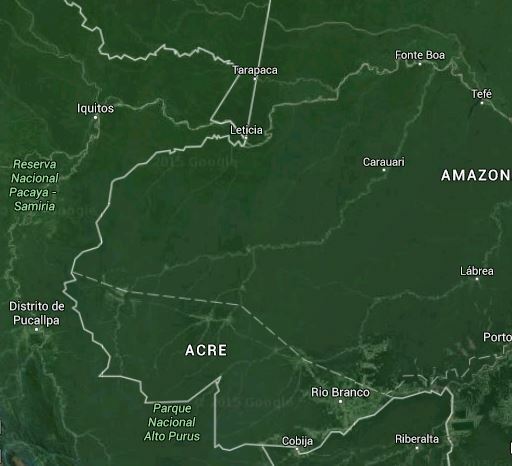 In January or February 2016, I will be somewhere on the Amazon river, on a boat, sailing upstream, deeper into the jungle. I will be on the way to one of the many tributary rivers of the Amazon, and chance may well dictate where I will end up next. I can get off the boat at Tabatinga (Brazil) and walk across the border to Leticia in Colombia. This is tricky too because there is no river that connects Leticia with the rest of Colombia, and the nearest national road is 800 km away. I would need to walk through the jungle, which is scary in itself, but particularly scary in Colombia due to the civil war between the Colombian government and the FARC rebels who have been fighting there for more than 50 years. Scarily, FARC also have a tendency to kill foreign hikers whom they suspect of being spies because they have a GPS or a camera with them. The lines are rivers and borders, not roads. There are no roads. Just in time for my trip to South America, the last problem is being addressed and considerable progress is about to be made in this longest-lasting conflict in the Western hemisphere. 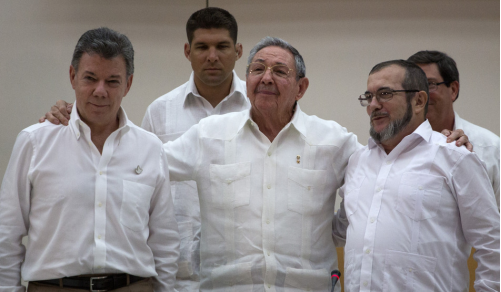 The Colombian government and FARC are on the last stretch to reach a peace deal. That’s good news, although their deadline of March 2016 means that I will still be crossing the impenetrable and highly dangerous jungle during a state of war, or a ceasefire at best. But I just hope that everyone will be tired of fighting already and that the rebels will be more concerned with polishing their CVs and negotiating book deals than with taking hostages. Now that this problem is out of the way, I hope someone will conclude a peace treaty with the piranhas and anacondas. If you are in Brazil, Colombia, Peru or Bolivia and know this area, I am curios to hear which option you would suggest. Thank you! ¡Gracias! This entry was posted in Bolivia, Brazil, Colombia, Military, Peru, Politics, Travel and tagged FARC, war. Bookmark the permalink. 12 Responses to Peace in Colombia? Just in time! Oh the other hand, the rebels might think of this as an opportunity to take as many hostages as they can before the peace deal is finalized. I’m looking forward to your travel reports. I’ve mentioned your post to Pia, a Colombian friend of mine, I think she would enjoy your South American travels too. I look forward to your adventures and commentary during your travels through South America. No matter where you go every day will be full of surprises and life that you have not experienced before. I am also already very excited. good luck in your trip. Bear in mind that travel within the Amazon is done mostly by air, either through airplane or helicopter to the most remote locations. Regular commercial river travel is rare, and roads mostly do not exist.